My name is Cameron, and I collect all different kinds of Band-Aids. 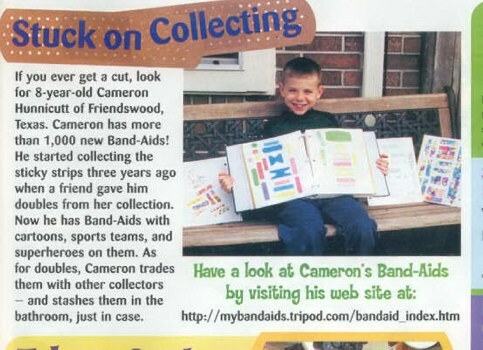 You can see all of them at Cameron's Band-Aid Collection. There is an article about me in the March 2004 edition of Owl magazine (see below). Paul and Jill asked me what you call someone who collects Band-Aids? They suggest "ouchiologist". I'm not for sure about that one. No matter what you call it or how you spell it...Band-Aids, Bandaids, or Band Aids...I call it fun. I have about 1000 different Band-Aids (by my count, please feel free to count them yourself)! Some of them I have bought, and others have been given to me by friends. A special thanks go out to the Band-Aid Contributors. If anyone has any band-aids to contribute or trade, please Contact Us.